Artist Susan Philipsz, Curator Maren Richter, Valletta 2018 Chairman Jason Micallef and Programme Coordinator Joanne Attard Mallia at this morning's press event for Valletta 2018's major visual arts exhibition "Dal-Baħar Madwarha/The Island is What the Sea Surrounds". 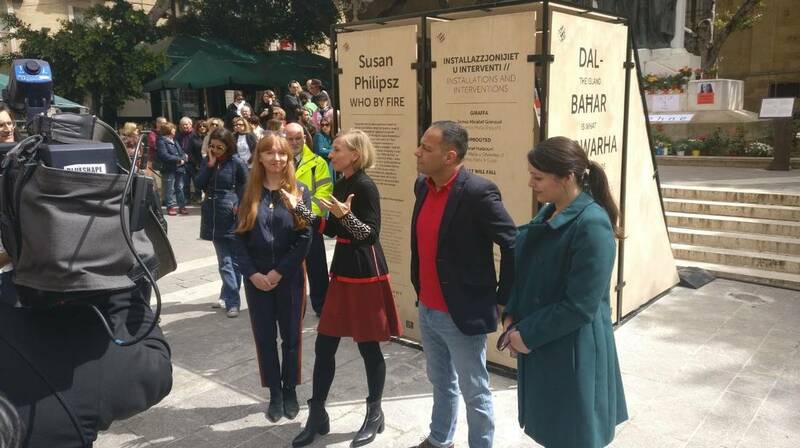 Valletta 2018 has opened the underground cisterns opposite the Law Courts as part of its major exhibition, Dal-Baħar Madwarha (The Island is What the Sea Surrounds). The underground cisterns host a site-specific sound installation by Susan Philipsz, Who By Fire, in which visitors can explore Valletta’s hidden underground. Philipsz’s commissioned sound installation in the cistern underneath the Law Courts refers to a damaged naval bell at the National War Museum in Fort St. Elmo that has been salvaged. This battered bell remains a reminder of the impact and force of air raids. Philipsz’s work addresses memories and loss of local cultures over time. Valletta 2018’s major visual arts exhibition, Dal-Baħar Madwarha opens on March 25th, and is spread across various sites including three locations in Valletta: part of the Valletta underground tunnels across the Law Courts, the old Pixkerija at Barriera Wharf, and the old Examination Centre at St Elmo. More than 22 established and emerging artists, both Maltese and international, are collaborating with the curator of this project, Maren Richter, and showcasing their work, which relates to both the concept of Maltese ‘islandness’, as well as contemporary social realities such as migration, traffic and real estate development. The exhibition remains open till July 1st , 2018. A large group exhibition is also being held at the Examination Centre in Valletta, where the work of several established and emerging artists from around the world will be on display. This exhibition includes artists such Heba Y Amin (Egypt), Hela Ammar (Tunisia), Bettina Hutschek (Germany/Malta), Raphael Vella (Malta), Gilbert Calleja (Malta), Fernando Sanchez Castillo (Malta), Lida Abdul (Afghanistan), Adrian Paci (Albania), Wael Shawky (Egypt/America), Antoine Cassar (Malta), Aaron Bezzina (Malta), Center for Political Beauty (Germany), Embassy for the Displaced/Scan Lab/Stevanos (International), Kristina Borg (Malta), transparadiso (Austria), Tania El Khoury (Lebanon), Fleeting Territories (Austria/Sweden) and Manaf Halbouni (Syria/Germany). Apart from the exhibition in Valletta, various large-scale structures have been erected in unexpected locations around Malta, as part of ‘Dal-Baħar Madwarha’. One of these structures is Ġiraffa, a large yellow crane situated at the Palumbo Shipyard, which has been converted into a giraffe by renowned local artist, James Micallef Grimaud. The artist’s intervention refers to the fact that the Maltese Archipelago is close to both Africa and Europe. Today Africa and Europe seem to be further away from each other more than ever, as new borders and new forms of migration have been established. A transformed crane painted as a giraffe welcomes travellers when entering the harbour or those in search for the iconic view over the Grand Harbour and celebrates tolerance and diversity of cultures. Fleeting Territories: Mapping Malta at the Customs House in Valletta – a temporary collective by Austrian artists Sabine Bitter, Helmut Weber and Klaus Schafler and Swedish researcher Jonatan Habib Enquis, is intended to raise the discussion that society exists between imagined and lived spaces in three different layers of space: Maltese airspace, maritime space, and the terrestrial space. Uprooted by Manaf Halbouni, is a collection of open-space installations in the form of cars in Valletta, Birzebbugia, and Hondoq Bay, Gozo, dealing with Malta’s relationship with cars, real estate development and displacement. Aidan Celeste’s What Will Fall, a sculpture constructed from a recently recovered industrial fishing net, sheds light on the notion of ‘Ghost Fishing’, a growing phenomenon that has led to an increase in marine pollution and a depletion of the sea’s natural resources, while Arċipelagu, an installation by Raphael Vella invites emerging artists from different Mediterranean islands to share their experiences of island life with a collage that incorporates drawings, writing, and videos. Other installations include Fleeting Territories: Mapping Malta (Part 1), No Man’s Land by Kristina Borg, Times of Dilemma by transparadiso and Sejjaħ lil Malta (Call Malta) by Tania El Khoury. Tickets cost €5 and grant patrons one-time access to each and every exhibition venue. The ticket remains valid for the entire duration of the exhibition period. Tickets can be purchased from tickets.valletta2018.org.